The action is finished in Event 21, $1,000 No Limit Hold’em, of the World Series of Poker. The first $1,000 on the schedule attracted 2,779 players that had 227 players survive Day 1 and only 17 that survived Day 2. 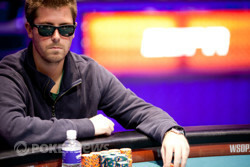 Michael Gathy outlasted them all and claimed the WSOP bracelet and $440,829. The day began with 17 players across two tables and within two levels the field was trimmed to just ten. William Fichman, Mitch Merritt, Jonathan Poche, Randy Green, Glen McCaffrey, Derek Wolter and Hok-Leung Wong all bowed out early. They relocated across the Amazon Room on the ESPN Main Stage for ten-handed play. After just 30 minutes or so Dan Smith was the first player eliminated on stage. Smith was low on chips and made a stand holding , but Noah Vaillancourt’s pocket eights held and sent Smith to the rail just short of an official final table. Just moments after the official final table announcements were made Joshua Field played his last hand of the day. He made a stand holding and Jamie Armstrong called holding pocket nines. Field didn’t connect with the board and was sent to the rail. Jason Manggunio arrived at the final table short on chips and shipped them in preflop. Eric Baldwin called and had Mangunnio outkicked. Baldwin held and Manggunio had . An ace fell on the flop but Baldwin’s kicker sent Manggunio to the payout desk. Jean-Louis Santoni opened from under the gun and called a re-raise from Vaillancourt. They went to a flop and got their stacks all in. Santoni held but Vaillancourt was drawing live with . A diamond fell on the turn and Santoni’s day was over. Eric Davis would be the sixth place finisher when he shoved and John Esposito called with . The board ran and Esposito’s flush sent Davis to the rail. Eric Baldwin’s fateful hand occurred when he four-bet shoved all in preflop. Noah Vaillancourt called after a lengthy tank and tabled . Baldwin held pocket queens but the board hit Vaillancourt square in the face when it ran . 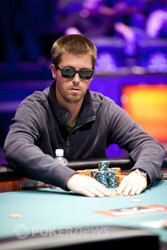 Baldwin picked up a fifth place finish in his third WSOP final table. It would be another hour or so before John Esposito exited in fourth place. He got in a bad spot with against Armstrong’s . They each paired their kicker card on the flop and Esposito never improved. Vailancourt’s final table ride had him yo-yoing up and down the counts. On his last downward swing Armstrong opened to 200,000 and Vaillancourt shipped it in. Armstrong called with and Vaillancourt was behind holding . 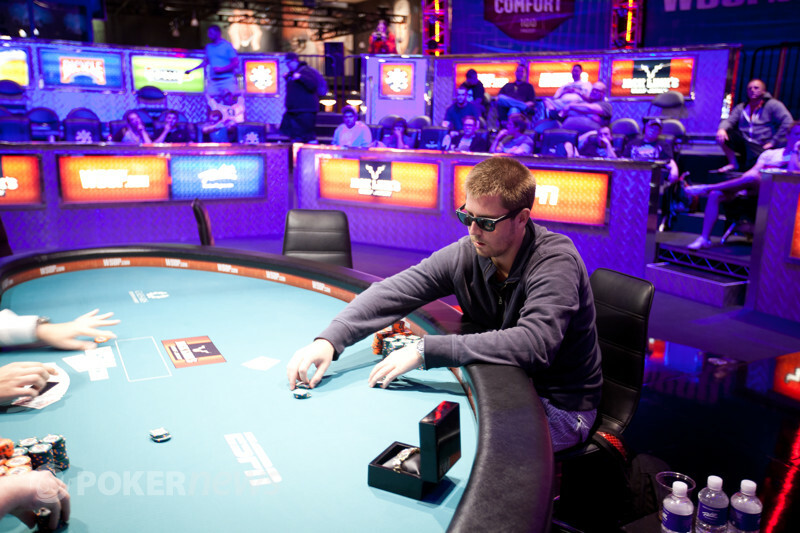 Neither improved their hand on the board and Vaillancourt exited the tournament with nearly $200,000 for third place. Heads up play lasted a little over two whole levels. The chip lead shifted back and forth throughout the night, without either player gaining a significant advantage over the other. The last hand came when Armstong four-bet shoved and Gathy called. Armstrong held pocket nines and Gathy pocket tens. The board ran and it was all over. 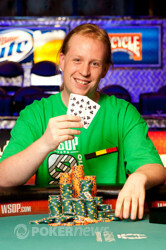 Gathy's tens held and he claimed his first WSOP gold bracelet. Jamie Armstrong opened to 250,000, Michael Gathy raised to 600,000 and Armstrong shoved all in. Gathy called and the hands were tabled. The board ran out and Armstrong was eliminated. Gathy secured his WSOP bracelet. Michael Gathy has been stealing many hands and has now stolen the chip lead as well. Jamie Armstrong opened for 240,000 on the button and Michael Gathy called. The flop came and both players checked. The turn came , Gathy bet 340,000 and Armstrong called. The river brought the , Gathy bet 740,000 and Armstrong called after a few moments. Gathy tabled for a full house and Armstrong mucked. Michael Gathy check-called a bet of 125,000 on a flop. On the turn we saw Gathy check again, and Jamie Armstrong bet out 300,000. A call was made and to the river we went. The was the last card to land and we again saw Gathy check-call a bet of 500,000. Armstrong showed for a pair of aces, which were good enough as Gathy mucked. We had an all in and a call preflop. The board ran and Gathy got back in the game. Jamie Armstrong limped in from the button recently, and found Michael Gathy giving a friendly check. Both players saw a flop, and the real action began. Gathy checked, and Armstrong bet 125,000. Gathy then raised to 285,000, and Armstrong three-bet to 625,000. Gathy made the call and we were off to the turn. A landed on fourth street and the two players knuckled the table for checks. A on the river saw a 555,000 bet from Gathy. Armstrong counterd by moving all in. After a few moments of contemplation Gathy threw it away and Armstrong took down the massive pot. On a board of Jamie Armstrong bet 425,000 on the river. Michael Gathy called and mucked when Armstrong tabled .